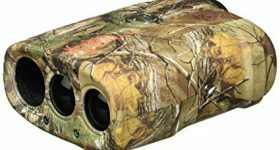 Bushnell is well known for making a wide range of optics that cater to hunters, and the Bushnell 202208 Bone Collector is one of the popular options available. Whether you hunt with a gun or with a bow, you will find this particular model to be a good companion for you when out in the wild. It is a 2-in-1 type of product since it is a monocular and a rangefinder in the same casing. Finding out more about what makes this model stand out from the crowd will help you decide whether the Bone Collector is a good option for you or not. Let’s see first what this model does, as the manufacturer’s specifications inform us. Bear in mind that this is a model with 4x magnification so you cannot expect the same performance as from a 6x model. The objective lens has 21mm in diameter, which is pretty standard for such a product. The laser used for the model is Class 1 and safe for the human eye. The range goes from 10 yards to 600 yards, and the model weighs 7.7 ounces, so it is pretty lightweight. It works with 9V batteries. When you go shopping for a laser rangefinder, the first thing you need to focus on is the distance the model can cover. In this case, the Bone Collector can calculate distances of up to 600 yards and can go as low as 10 yards. The maximum error allowed is one yard plus or minus, so you will get entirely accurate readings when you’re using this particular rangefinder. There is something that must be pointed out here, as the 600-yard range is only for highly reflective targets. Anything that doesn’t reflect light too well can be seen at 400 yards or less, so that is something you might want to bear in mind when you compare the Bone Collector to other similar models on the market. Roof prism optics are used for this rangefinder, and the image you can see through it is pretty clear and without any noticeable chromatic aberrations or other mishaps. One of the upsides is that you can use the LCD display in low light conditions and still get a clear image, something that hunters appreciate, seeing how they may hunt in various situations. With a field of view of 320 feet at 1,000 yards, it is safe to say that this model does a pretty good job, as you can use it as a monocular, too. The long eye relief, of 20mm, is quite convenient, and people who wear glasses will find it comfortable to use. The optics are fully multi-coated, so glare is not usually an issue. The focusing is also great, and users can expect more than decent performance as far as optics are concerned. The Bone Collector is built to withstand inclement weather, as the housing is rainproof and quite durable. For a model as compact and lightweight as this one, you will be surprised how sturdy it feels when you hold it in your hand. You will also be quite pleased with the fact that it is small enough to fit in a shirt pocket so carrying it around with you will not be an issue for sure. The one-button operation helps with the ease of use, and the textured material on the button will allow you to use it even with gloved or wet hands. 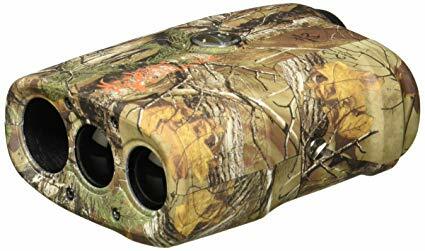 This model from Bushnell is pretty standard, so it doesn’t come with too many extras. You will get a case with your purchase so that you can carry it in maximum safety conditions. Otherwise, you will not find other accessories packed with your rangefinder, so, if that is something essential for you to have, you may want to look around some more. Nonetheless, the overall performance and durability recommend this product. If you want a straightforward, easy-to-use rangefinder, you cannot go wrong with this one. The Bone Collector is compact, lightweight, and painted in the attractive RealTree Xtra camouflage pattern. It doesn’t come with many bells and whistles, but you will like its versatility of being both a monocular and a rangefinder. The optics quality is superior, and overall, you will be satisfied with your purchase.